we lost our new puppy Wednesday night. My 5 year old let her out and is devastated. 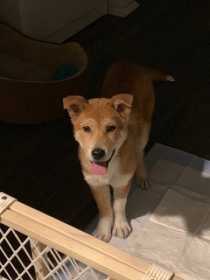 She is a 5 month old tan and white Jindo mix. We live in Round Rock off 45. Closest intersection Louis Henna Blvd and Greenlawn. She ran to the area behind Dell. She has no chip and a light blue collar on.